The Granary is a converted barn, retaining many original features. The entrance is into an open plan living room and kitchen. The roof space has been opened up exposing the timbers, a log burning stove is set in the original fireplace. The bathroom has a double ended bath with shower over. There are two bedrooms downstairs, a double with a king size bed and a twin room with two single beds. Dog friendly, the holiday cottage is a great place to base your Cornish self catering holiday. Due to an open stream running close to the property children must be supervised at all times. The Granary and Bowgie are self-contained four star self catering holiday cottages adjoining the Grade ll listed Trewerry Mill. Perfect for summer holidays, Christmas, New Year, winter, short and weekend breaks. A 2-night minimum stay applies. We are dog friendly with 1 acre of grounds for walks. We also suit families with Grandparents. If you are new to the area, the information in this page will provide details about the surrounding area. First of all, a little more about your surroundings. Trewerry Mill (which is next door to the cottages) dates to around 1639 and was partially rebuilt in 1820. The mill was one of several that served Trerice Manor (now owned by the National Trust and just five minutes walk up the road), and was in use until the 1950s. Across the road, by the stream, stands an old railway bridge. Trains used to run from Newquay to Chacewater, and would stop just outside the mill at Trewerry Halt. There is a woodland walk along the old track-bed which is open to guests, leading to a pond area at the northern-most tip of the property. The beaches of North Cornwall are of breathtaking beauty and within easy reach, enjoyable to explore whatever the season, perhaps with a picnic tucked up in rucksack. Head for Crantock, Holywell or Perranporth beaches for wonderful sandy open bays, or if you prefer to get away from it all, try Polly Joke. It’s a bit of a hike from the car park, but worth it for the walk and the seclusion. Fistral Beach in Newquay is the place to go for surfing action, or just to watch the hot shot surfers. Nothing’s better than a relaxing sundowner at the Windswept café, at the south end of Fistral beach on a sunny day, watching the surf go by. And of course there is Watergate Bay, used as the filming location for Echo Beach and where you can find Jamie Oliver’s ‘fifteen’ restaurant. If you have time, the seals in Newquay harbour are always on the lookout for an audience (or for a spare fish!). There are many things to see and do in Cornwall. Why not go for a walk around Trevose Head, and call in at Padstow on the way back? Or take a turn around Pentire Headland, with views over the stunningly beautiful Gannel Estuary (you can always call in at the Lewinick Lodge for a refresher, with magnificent views to Fistral beach). The Eden Project has become as famous for its evening events as for its conservation biomes, or head for the more mature landscapes at the Lost Gardens of Heligan. The Reef Centre in Newquay has some surprisingly exotic sea life, and closer to home are Trerice Manor, the former seat of the Arundell family, as well as the Lappa Valley Railway, a must for younger guests. For thrill-seekers, check out the Extreme Academy at Watergate Bay, or the Adventure Centre at Lusty Glaze for surfing, coasteering, rock climbing and much more. There are two golf clubs nearby, a 12 hole locally at St Newlyn East and Newquay Golf Club, one of Cornwall’s finest seaside links. The number of restaurants in Cornwall has greatly expanded in recent years. Booking is advisable, especially on Friday or Saturday nights. In Newquay, try the Harbour restaurant, great foof and it has wonderful views, and is good for fish. If you fancy a curry, the Maharajah is hard to beat. Locally, there is the Pheasant Inn in St Newlyn East, about a mile away, but don’t forget your torch if walking there at night! Or try the Smugglers’ Den, a sixteenth century country inn near Cubert, about 10 minutes drive, away. For dining locally, why not try Lerwinnick Lodge in Newquay, or for a nearby gastropub head for the Plume of Feathers in Mitchell, both are a short drive from Trewerry cottages. I am a currently a house husband that lives onsite in the adjacent Mill so can be of help when required. The Granary shares the Courtyard with our other property; the Bowgie. Had a lovely stay here. 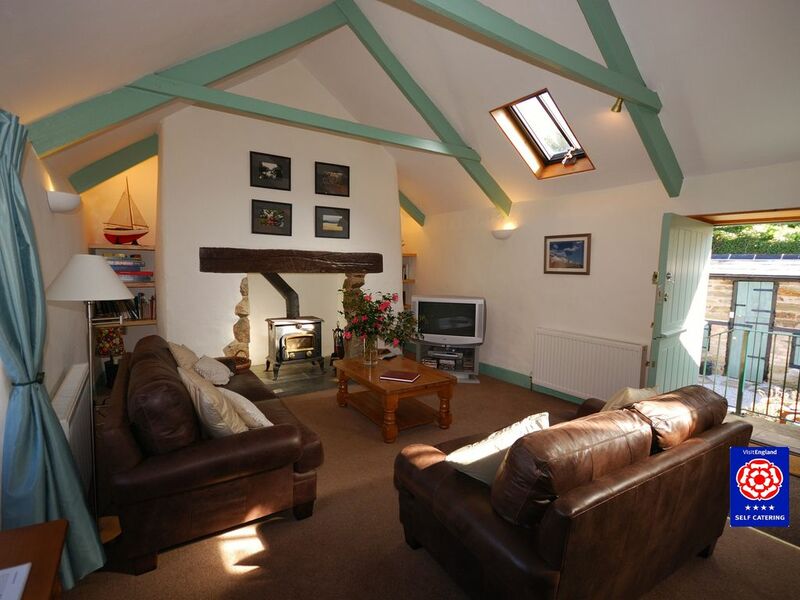 Beautiful and quiet location with very easy access to nearby Newquay and all of Cornwall. Rupert (owner) was extremely friendly, approachable and happy to help. Definitely recommend.